PICTURE: Bulli Rock Baths C1908 with visiting eel. Image digitally altered. 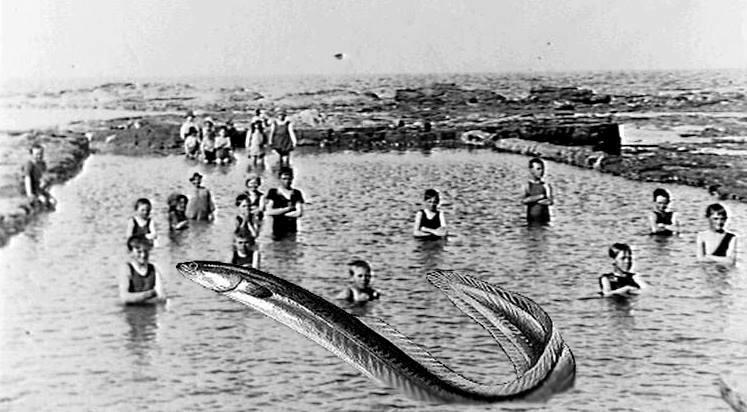 Illawarra Mercury Friday 18 December 1908: A large eel, measuring four feet by 10 inches was found in Bulli baths on Friday last. A number of ladies were bathing at the time and received a great shock on discovering the stranger, which was afterwards captured. Members of the CIB vice squad, under Inspector Crothers, raided billiard saloons at Coledale, Thirroul, Bulli, and Austinmer on Friday night and arrested five men on charges of managing and conducting common gaming houses. The police seized 17 poker machines. The men will appear at the Bulli Court next Friday. - Sunday Herald (Sydney) Sunday 3 June 1951.